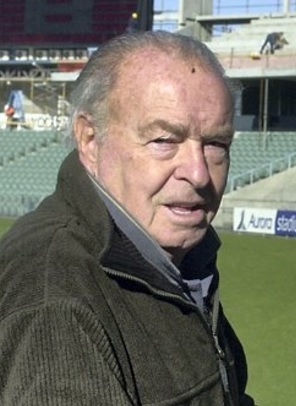 A stalwart of northern football, George Viney faithfully served the City/City-South and South Launceston Football Clubs for more than 55 years as a trainer and volunteer. Born in 1926, Viney began his career as a trainer with City in 1947 under coach Bob Bawden, and over the following 40 years he would be as much a part of the fabric of the club as the players themselves. Between 1952 and 1974, the Redlegs – under such legendary coaches as Bob Miller, Stan Morcom, Graeme ‘Dreams’ Wilkinson and Stuart Barclay – annexed 10 NTFA and four state premierships; Viney was front and centre for each and every one, massaging and nurturing his boys to ensure that they were in top physical shape. In 1986, when City-South merged with NTFA rivals East Launceston to form the South Launceston Football Club, Viney served the new entity with as much passion and dedication as he had City-South, contributing to a further two senior premierships with the Bulldogs in the late 90’s. Though incredibly gifted at his craft, Viney never received a cent for his services; not that this ever bothered him, for it was his deep love of football that kept him coming back every Saturday. His hunger for the game verged on the physical, with Viney once remarking that missing a game of football felt to him like he’d missed a meal. Incredibly, Viney’s dedication to his boys saw him miss just a single game of football – to attend a wedding – in his 56 consecutive seasons of service, and by the time he finally retired at the end of 2002 he had served his two clubs in well over 1000 games. An enormously popular individual both within his club and in the wider football community, Viney’s contributions to his clubs were regularly recognised, especially after he had stepped away from his training role, with long-time City-South player and coach Graeme ‘Dreams’ Wilkinson particularly full of praise. Viney continued to follow the game closely post-retirement, though he despaired at what he perceived as the overuse of handball in modern football, fondly reminiscing back to the glory days of the NTFA when it was a more “man to man” game. George Viney passed away in 2012 at the age of 85.